This book is the final word on the JFK Assassination and it’s connection to the Watergate break-ins in 1972 and the eventual seating of the first unelected President in the history of the United States. From there it moves on to explain how George H.W. “Poppy” Bush, with the aid of Zappata Off Shore Oil (headquartered in Medilin, Columbia (200 miles from shore) went on to become President of the United States, establishing a political dynasty along the way and leading to the election of Geoge W. Bush and the Iraqi war. Ever wonder what the Pepsi Convention in Dallas had to do with the murder of the President? Ever asked yourself how could anyone possibly engineer a plot so tightly that it would ensure that the President would pass by the Book Depository? Ever wonder who owned the Book Depository Building and how Oswald got the job a mere 6 weeks before Kennedy’s visit? Ever think about what, if any, was Vice President Johnsons’ role in all of this? Why were 3 of the countrys’ subsequent Presidents in Dallas on the day of the assassination and what does their presence there indicate? What was Abraham Zapruders unwitting role in all of this? And why was his 8mm film taken by Time-Life and locked away from the public until New Orleans Attorney Jim Garrison forced its release with a Freedom of Information Act Lawsuit? These are not rhetorical questions. They are the details that have bugged me for years. 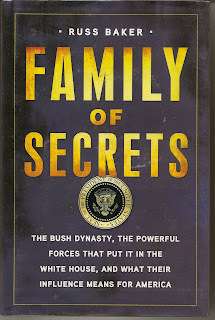 And this book takes it all the way back to Prescott Bush and his early days establishing his family in finance and oil. The trail is murky until you shed some light on it as Mr. Baker has painstakingly done with this book. For those that believe Lee Harvey Oswald was a lone nut, acting of his own twisted accord, this book will not interest you. But if you, like myself, Lyndon Johnson, Richard Nixon and Gerald Ford, to name a few, have any lingering doubts as to what really happened, then this is the book for you. Layer upon layer of twists and turns all lead back to the inescapable conclusion that the Oil Lobby along with the CIA plotted, planned for and finally executed the President of the United States. Who pulled the trigger is another story- and a backseat one at best. The real story is who paid for and orchestrated the biggest crime of the 20th Century. A crime that has continued to pay dividends to the oil industry, the munitions manufacturers and one particular family. Follow the political growth of the Bush family from its nefarious oil dealings as Zappata Off Shore Oil Group through the turbulent late 50’s and the 60’s. Follow the money as it flows and funds covert op after covert op. Follow George H.W. Bush on his climb to the 41st Presidency of the United States. Who was George DeMohrenschildt and why did he and his wife take Lee and Marina Oswald under their wing during the months leading up to the assassination of the President? What was the connection between the Bay of Pigs and Dallas and later Watergate? Why did President Nixon demand that the Watergate Burglars be paid off or it would “lead back to the whole Bay of Pigs thing.” And why did Richard Helms react so violently when this was relayed to him by H.R. Haldeman? This is the penultimate book on the covert operations of the 1950’s CIA in Latin America and Southeast Asia. It ties together all the questions raised and argued by conspiracy theorists and refutes all the assertations put up by the Lone Assassin Theorists, showing along the way what the real goals were and how they were achieved. Follow George W. in his early years and see how he was groomed to protect the family and secure power, both political and financial. I cannot recommend this book enough. For me it is the final word on the events of November 22nd, 1963. It is also an explanation of the Watergate Burglary and its ultimate consequences for American politics, right up to the present day. You will be amazed by this painstakingly researched and annotated book.